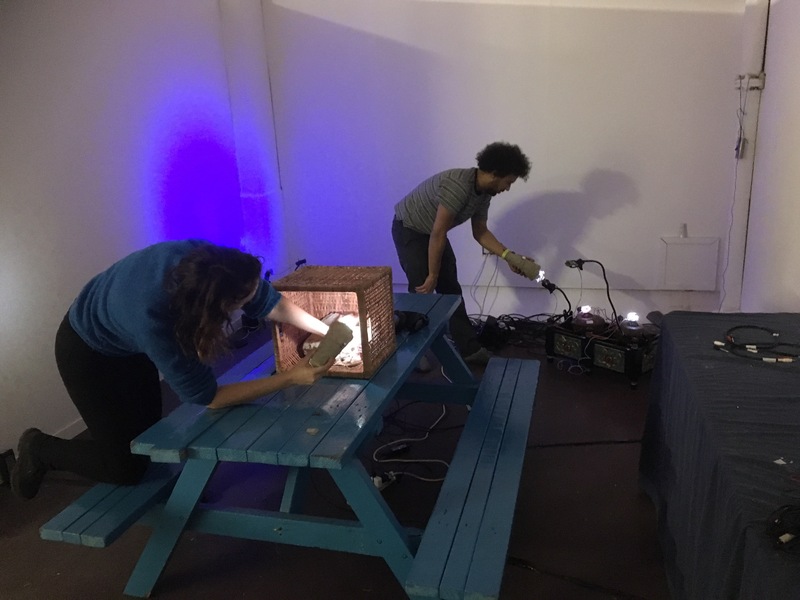 This interactive installation was presented at the Old Truman Brewery as part of Hackoustic Village, November 2017. Visitors were invited to explore a darkened room with interactive hand-held devices, created especially for the occasion. While holding down a button, the torch measured the intensity of light wherever it was pointed, which was translated into tangible vibrations. Upon releasing the button, the light would be played back from the front as a flickering pattern. This meant that visitors could essentially take the flickering lights from around the room and move them to other places, shining them onto other objects that responded in turn with sound and more lights. Two visitors holding their own torches could pass light patterns to each other, or patterns could also be created by moving back and forth. The overall piece was presented as a work in progress, a kind of open studio in an attempt to show my process and environment to passers-by. The most satisfying aspect for me as an artist, having proved that the technical concept worked, was the conversations that it brought about.